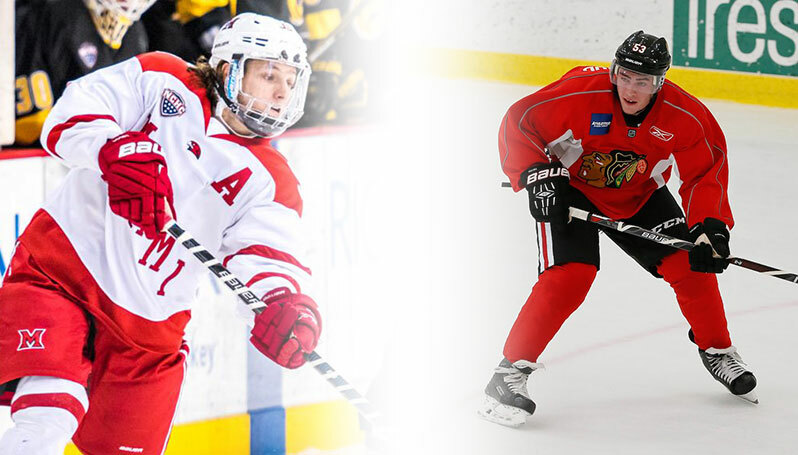 Rockford, Ill. - The Rockford IceHogs announced today that they have signed forward Anthony Louis and defenseman Luc Snuggerud to amateur tryout contracts (ATO). Louis has also agreed to terms with the Chicago Blackhawks on a two-year contract that begins next season and runs through the 2018-19 campaign, while Snuggerud has agreed to a three-year deal with Chicago that runs until the end of the 2019-20 season. Additionally, Robin Press has been assigned to the Indy Fuel (ECHL) and Tyler Barnes has been loaned to the Allen Americans (ECHL). Louis, 22, recently finished his senior season at Miami University (Ohio) where he led the team in points (39) and assists (25) while tying for the team lead in goals (14) through 36 games. His 39 points ranked him third in the National Collegiate Hockey Conference (NCHC) and he established career-high marks in both points and goals. Louis was also the recipient of Miami’s Dr. Phillip Shriver Rookie of the Year award in 2013-14 after posting 12g-13a-25pts in 36 appearances. A native of Winfield, Ill., Louis totaled 46g-80a-126pts in 145 games over his four-year career at Miami (2013-17). Prior to joining the RedHawks, he won four state championships (eight in total) with both the Chicago Mission and Team Illinois. Louis was drafted by the Blackhawks in the sixth round (181st overall) of the 2013 National Hockey League Draft. Snuggerud, 21, competed for three seasons at the University of Nebraska Omaha and this year was named to the NCHC All-Second Team after collecting career-highs in goals (11), assists (20) and points (31) in 39 games for the Mavericks. His 11 goals was tops among all NCHC defensemen while his 31 points ranked second. A native of Eden Prairie, Minn., Snuggerud finished his collegiate career with 17g-48a-65pts in 113 career games. He was drafted by Chicago in the fifth round (141st overall) in the 2014 National Hockey League Draft. Press, 22, played in six games with Rockford since being recalled from the Indy Fuel on Feb. 3. He has skated in 23 games for the Fuel, notching 1g-8a-9pts. Barnes, 27, has split the 2016-17 season between the Rockford IceHogs and Indy Fuel. The Burnsville, Minn. native made his IceHogs debut on Oct. 21 at Grand Rapids and has totaled 4g-3a-7pts in 25 AHL games this year. Barnes has also registered a point per game with Indy, totaling 5g-10a-15pts in 15 ECHL games for the Fuel. Next Home Game: Saturday, March 25 vs. Grand Rapids, 7 p.m. The IceHogs host Country Night with the first 1,500 fans in attendance receiving a cowboy boot mug, courtesy of Pepsi and Dusty Boots. The Hogs will also host their fourth annual Sock Drive with donations benefitting Project Undershare.